Maine is home to 35 accredited colleges and universities, with many more research, outreach and cooperative extension centers statewide. Deciding on the right college involves doing research, from considering the length and type of degree programs available to tuition cost to campus lifestyle. Fortunately, we have applied our rigorous methodology to the latest education data to rank the best colleges in Maine, including the top four-year and two-year schools. The University of Maine System consists of seven public four-year schools; a law school; and more than 35 research, outreach and cooperative extension centers statewide. Maine is also home to 21 private higher education institutions. All of Maine's university systems (including private universities) are autonomous and oversee their own procedures and administration. Maine enrolls about 40,000 students every year and reaches over 500,000 people through its educational and cultural offerings. Though not a large increase, the number of earned bachelor's degrees has increased by about 1% over the past 10 years (2004-2014). However, about two-thirds of alumni live full-time in Maine. According to Maine's Department of Education, about 75% of students attending a public university in Maine receive financial assistance. Maine places an emphasis on public service and green technologies, and students will find a range of these and other programs of study at many of the top four-year schools listed below. Tucked away in coastal Brunswick, Bowdoin is renowned nationwide as not only one of the best colleges in Maine, but as one of the best liberal arts colleges in the country. Established in 1794, Bowdoin prides itself on close collaboration between its 1,805 students and its faculty, 99% of whom have a Ph.D. For every nine students, there is one faculty member. Students can choose between 40+ majors, all of which hone the same skill set -- critical thinking, writing, reading, and speaking. Majors are generally broad, liberal arts disciplines, such as mathematics or English, although Bowdoin does have specialized programs in teaching and coastal studies, in addition to a dual degree engineering program with partners like Columbia University, Cal Tech, and Dartmouth. Outside of class, Bowdoin offers a wide variety of sports and clubs -- 31 varsity teams and over 100 student organizations -- emphasizing on-campus involvement. Over a third of the student body is a varsity athlete, and Bowdoin’s large, popular Outing Club offers over 100 outdoor trips per year. Situated in central Maine, Colby's rigorous academic program is rooted in deep exploration of ideas and close interaction with world-class faculty scholars. Students pursue intellectual passions, and can choose from 58 majors or develop their own. Independent and collaborative research, study abroad, and internships offer robust opportunities to prepare students for postgraduate success. More than 100 courses from across disciplines integrate resources from the world-class Colby Museum of Art to enhance the academic experience. Colby’s unique Jan Plan program encourages focused time for study, interning, or research on or off campus. Students lead active, healthy lives through one of the 32 varsity sports teams, numerous club sports, and other fitness options. In 2013 Colby was the fourth college or university in the nation to achieve carbon neutrality. Colby is a community of 2,000 dedicated and diverse students from around the globe. Its Maine location provides easy access to world-class research institutions and civic engagement experiences. The Colby Commitment removes financial barriers to ensure students from every background have access to the best possible education. Founded by abolitionists in 1855 as the first co-educational college in the New England region, Bates College prides itself on a focus on social justice -- it was integrated even before the Civil War. Bates constructs its sub-2000 student population with equality in mind, carefully maintaining a 50/50 gender ratio, culling 22% of its students from underrepresented groups, and banning exclusive organizations like fraternities and sororities. Bates’s students can choose from 36 majors and 25 minors, and several features of its academic program separate Bates from other Maine colleges. For example, social justice is at the heart of everything Bates does, as community service is built into most majors and the “Purposeful Work” initiative ensures that Bates students find meaning in their careers and contribute to “the world beyond oneself.” Moreover, Bates students have a particularly strong thirst for foreign shores, as the Lewiston school is one of the top producers of Fulbright Scholars in the country, including 18 in 2015 alone. With a network of campuses in Bangor, Westbrook, and Presque Isle, Husson offers a wide spectrum of programs to its 2750 undergraduate and 750 graduate students. Husson is one of the most pre-professional colleges in Maine, as it prides itself on its “premier professional programs” and its mission statement includes a focus on preparation for professional careers. Notably, the current governor of Maine, Paul LePage, is a Husson alumnus. In keeping with its pre-professional mission -- and since it was originally founded as a business school -- some of Husson’s more popular undergraduate degree programs reside in the College of Business, including accounting, business, and law. Husson's other majors are grouped under the umbrellas of the College of Health and Education, the School of Pharmacy, the College of Science and Humanities, and the New England School of Communication. Husson is also home to an extended learning program that includes a number of online business-related degrees. Located in Bar Harbor on the northeastern tip of Mount Desert Island, College of the Atlantic’s campus sits right on the coast. COA’s curriculum is also perhaps the most unique out of all colleges in Maine. Believing that majors are artificial divides that don’t reflect the real world, COA has exactly one major -- human ecology, or the study of human-environment relationships. Each student designs his or her own curriculum, centered around one of 18 “constellations of interest” that are as wide-ranging as visual arts, ethnography, farming, and consciousness. COA’s tiny student body of 350 students is diverse, with 20% hailing from outside of the United States. Two out of every three COA students are women, and over half of the student body studies abroad. In order to complete their degrees, COA students must earn 36 credits and fulfill a loose set of distribution requirements that include community service, a senior capstone project, a writing portfolio and an internship. These requirements are fulfilled in small classes (average size: 12) and by small course loads -- students take three trimesters of only three classes each. Located in the heart of the Saint John Valley -- one of the final remaining outposts of French-English bilingualism in the United States -- the University of Maine at Fort Kent is distinct from other colleges in Maine in that a great number of its 1,559 students are French speakers. UMFK’s liberal arts curriculum offers 15 bachelor’s degree-seeking majors, in addition to 19 minors and a number of associate’s degree-seeking programs. About half of UMFK’s programs of study can be completed online. UMFK’s general education program is extensive, as all students must complete 38-42 credits worth of gen ed courses, which are divided into three categories -- personal and social responsibility, general knowledge, and intellectual and practical skills. UMFK also leverages its bucolic setting to provide rural-specific education opportunities to its students, with the aim of creating the next generation of leaders in rural communities worldwide. Finally, G.I. Jobs<?i> designated UMFK a Military Friendly School, citing its small class sizes, personalized attention, and online education opportunities. A liberal arts branch of the University of Maine system and Maine’s oldest public university, UMF positions itself as a more affordable alternative to more prestigious schools like Colby, Bates, and Bowdoin. UMF’s 1,800 full-time students can choose from 32 different undergraduate majors or design their own. UMF commits to a liberal arts-style education -- the student to faculty ratio is 13:1, the average class size is 17 students (63% of all classes have less than 20 students), and there are no teaching assistants. UMF also strives to be one of the most affordable colleges in Maine, as 97% of its students receive some sort of financial aid. UMF’s teacher education programs are particularly popular -- since 2006, seven Maine Teacher of the Year award winners have graduated from UMF with education degrees. UMF also offers master’s degree programs in early childhood education and educational leadership. As the University of Maine system’s flagship campus in Orono, UM is one of the largest colleges in Maine, and its curriculum is perhaps the most expansive. Its 11,286 students can choose between 90 undergraduate majors, 70 master’s degree programs, and 35 doctoral offerings. In particular, UM’s science, technology, engineering, and mathematics-related majors are popular, with a large spike in enrollment since 2011. The school believes that STEM degrees are the future of Maine’s workforce, and that the future of Maine’s economy depends on graduates with STEM degrees. The school also focuses on STEM education. Other historically strong programs at UM include climate change, marine sciences, forestry, and advanced materials for infrastructure and energy. Finally, functioning as a bit of a liberal arts subset of the larger whole, UM’s honors college centers around critical analysis in a number of different fields, focusing on civic engagement and providing smaller classes than UM’s typical fare. A Roman Catholic, pre-professional liberal arts college which sits on Sebago Lake outside of Portland, Saint Joseph’s College of Maine offers 40 bachelor’s degree, master’s degree, and certificate programs. As an alternative to an on-campus experience, Saint Joseph’s offers one of the most extensive selections of online programs of all Maine colleges. In addition to its on campus enrollment, SJCME enrolls 2,400 students in all 50 states in its online programs. Saint Joseph’s motto is “personalized, career focused education.” As such, a number of its programs are in practical fields such as business, accounting, criminal justice, information technology, and health administration. The Career Development department also offers advising and a career development program called Connections, which starts on the first day of school and involves alumni panels and other events. For on-campus students, Saint Joseph’s also offers a substantial array of study away options, including in-house programs in Spain, Iceland, and New England/Canada as well as a variety of third party options. With three different campuses (in Lewiston, Gorham, and Portland) and an expansive catalog of on-campus and online course offerings for its nearly 10,000 students, the University of Southern Maine is one of the biggest colleges in Maine. USM offers more than 50 degree programs -- bachelor’s, master’s, and doctorates -- in around 115 different areas of study, including the popular and Association to Advance Collegiate Schools of Business (AACSB) accredited USM School of Business. Programs of study are divided among five different colleges -- arts, humanities, and social sciences; management and human services; science technology, and health; Lewiston-Auburn; and the UM School of Law. USM boasts connections with local partners for internships and employment opportunities, including business, governments, and even a triple A baseball team. USM also employs an Office of International Programs with a number of different study abroad opportunities, and USM’s online college offers more than 15 online degree and certification programs in fields such as business administration, leadership studies, and communication. Originally founded in 1909 as a “normal school” - or teacher college - the University of Maine at Machias now specializes in education, recreation, and environmental studies, including marine biology. Centered around “environmental liberal arts,” UMM requires each student to complete a set of core courses in a variety of environmental studies disciplines. UMM also markets itself as “Maine’s Coastal University,” leveraging an advantageous location - 15 minutes from the Atlantic Ocean, the first university in the country to see the sunrise - to provide opportunities for hands on biological and environmental research and inquiry in Maine’s Bold Coast. UMM is home to 800 students, and offers 11 majors and 28 minors, including strong programs in environmental recreation and tourism management, education, and marine biology. This small, rural university is nationally-recognized for its uniquely LGBTQ-friendly campus. Small class sizes are the norm (averaging 17 students), and everyone benefits from a 12:1 faculty to student ratio. With two campuses in Maine proper (Biddeford and Portland) and an auxiliary location in Tangier, Morocco, the University of New England has the most students of all Maine colleges with 12,245 enrollees -- 7,413 undergraduates, 3,169 graduate students, and 1,663 professional students. UNE has grown astronomically in the last 10 years, as in 2006 the school only enrolled 4,000 students, and its stated goal is a raised profile on the national level. UNE offers 40 undergraduate 32 graduate/professional programs, mostly centered around health sciences and to a lesser extent the liberal arts. Popular undergraduate programs like nursing, nutrition, pre-pharmacy, public health, medical biology, and dental hygiene advance UNE’s mission of “innovation for a healthier planet,” while an extensive education program also provides teacher training as a secondary option. UNE also offers health-related doctoral programs in pharmacy, physical therapy, dental medicine, and osteopathic medicine. Originally established to provide continuing education to students in the University of Maine System, UMA offers associate, bachelor's, and graduate programs to both recent high school graduates and working professionals. The university offers degrees in the liberal arts and sciences and in professional studies. UMA provides affordable, accessible education, and in 2018, the university introduced its Pine Tree State Pledge tuition guarantee program. Open to new applicants and in-state transfers who have earned at least 30 credits at an institution outside the University of Maine system, the tuition guarantee program allows students to earn their undergraduate degree with no out-of-pocket tuition expenses or fees. Students in the program are responsible only for related costs such as textbooks, commuting, and housing. The tuition guarantee program makes UMA one of the most affordable colleges in Maine for in-state undergraduate students. The University of Maine at Presque Isle was originally founded in 1903 as a teacher college. Since then, it’s undergone four name changes, eventually becoming part of the U of M system. UMPI maintains strong teacher education programs -- including a one year credential program -- in addition to 21 other bachelor’s degree programs as well as 18 concentrations, 35 minors, five certificates, and seven associate’s degree seeking programs. Programs are divided into four categories -- art & science, education, professional, and university-wide. UMPI is the only Maine college with a curriculum centered around personalized learning. Students are allowed to proceed through material at their own pace and are allowed to complete courses in a number of different ways, whether it’s through an internship, on campus, or online. Since students can accelerate the pace of their classes through personalized learning, UMPI is often a cheaper alternative -- the average student leaves UMPI with only $5,000 less in debt than at the average college. 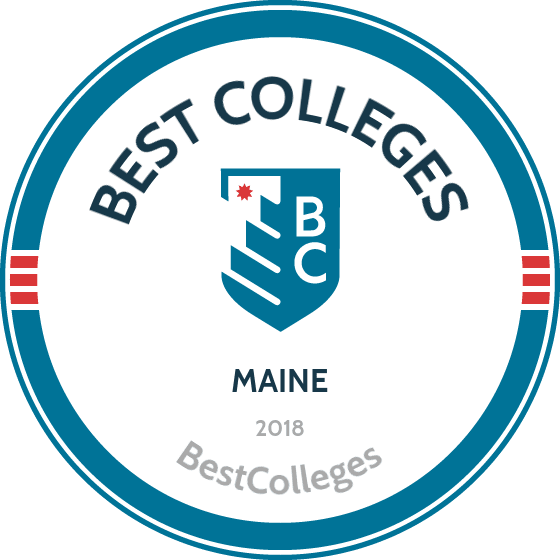 As far as colleges in Maine go, tiny Thomas College - with an enrollment of less than 1,000 students - is the second most renowned in Waterville, behind the more prestigious Colby. However, Thomas has its own distinct features. Originally founded as a business/career school, Thomas places particular emphasis on post-graduate employment through its Guaranteed Job Program (GJP). If a student meets a series of 10 requirements - including maintaining a 3.0 GPA and completing an internship -- Thomas guarantees each student will receive a job out of college. If qualifying students do not find a job, Thomas pays their student loans for a year and offers free enrollment in Thomas master’s degree programs. In addition to the GJP, Thomas offers 35 undergraduate majors. True to its roots, business and accounting are popular choices, although Thomas also offers programs across the arts and sciences. The majority of Thomas degrees can be completed in three years, provided that students complete a total of four compressed online classes during the summer. The Maine Community College System is comprised of seven schools statewide. MCCS emphasizes small class size and accessible faculty, as well as opportunities for students to study abroad and participate in summer programs, join clubs and associations and play organized sports. The number of associate degrees earned has decreased by almost 4% over the past 10 years (2004-2014). To help maintain and increase its number of graduates, The Foundation for Maine's Community Colleges, which was created in 2009, has raised funds to ensure its community colleges have the resources needed to offer all students an affordable education. Since its founding, the foundation has raised $26 million for expanding academic programs, improving student support services and implementing the latest technology. Over the past few years, MCCS has also made a concerted effort to create and invest in programs in the energy services technology and sustainable agriculture industries. Another initiative designed to increase opportunities in the IT sector, through programs such as the Maine is IT! grant program. An increased investment in schools and program opportunities makes it an ideal time to begin your college education at one of the two-year schools listed below. Kennebec Valley, one of seven colleges in the Maine Community College system, is located in Fairfield, which is home to about 2,500 students. Created in 1969 by the Maine Legislature, KVCC offers 36 degree and certificate programs in 11 fields, including trade-related, healthcare, business administration, culinary arts, and IT. In 2016, KVCC opened an honors program which includes internships and cross-registration at Colby College, the University of Maine, and Thomas College. Kennebec offers one of the cheapest tuitions of all community colleges in Maine, charging $92 per credit hour for Maine residents and $184 per credit hour for non-residents. In order to help students earn four year degrees at other schools, KVCC has a block transfer agreement with the University of Maine system. All core/general studies courses taken at KVCC transfer to any bachelor’s degree program at any school in the University of Maine system, including Thomas College, Husson University, and the University of New England. The Maine College of Health Professions trains practitioners for healthcare science careers. Associate degree programming emphasizes best practices in patient care and safety. The school's educational model blends general education, didactic instruction, simulations, and practical knowledge acquired through hands-on training in clinical settings. MCHP, one of the top schools in Maine for associate degrees in healthcare, offers degree plans in nursing and radiologic technology. The associate of applied science in nursing gives students experience in a comprehensive range of areas, including critical care, maternity, pediatrics, mental health, and cardiac care. Students learn using state-of-the-art simulation labs and participate in clinical rotations with a low student-to-faculty ratio. The AAS in radiologic technology immerses students in classroom study and clinical training, during which they learn patient care, patient positioning, radiation safety, and how to use radiographic equipment. The school also offers an RN to BSN program and certification in computed tomography. Students at York County Community College in Wells, Maine, engage in learning to update skills, begin their college education, and train for new careers. The school offers associate degrees in a range of fields, including accounting, nursing, criminal justice, and business administration. The school's associate in applied science in gerontology, for example, teaches students about the aging process and issues related to end of life. Students can use electives to learn about social services and policy making. YCCC, one of the top community colleges in Maine, also offers an AAS in trade and technical occupations for students who have completed a registered apprenticeship and would like to earn a degree. The AAS in digital media focuses on computer software and its applications and includes two concentrations in animation or graphic design. YCCC offers small classes, flexible scheduling, and support services. The Landing is unique among the community colleges in Maine because it focuses on teaching one skill: how to build boats. With a history dating back to the 1600s, The Landing has been home to as many as 20 shipbuilding companies. In 1978, The Landing School was founded to continue this tradition. Enrolling between 70 and 80 students each year, The Landing offers four programs of study: yacht design, marine systems, wooden boat building, and composite boat building. Each program consists of 36 credit hours, and students must attend 90% of classes to graduate. The curriculum focuses on traditional construction methods and contemporary boat building techniques and materials. The Landing School is one of the only colleges in the country to offer associate degrees in boat building and it features the largest variety of boat building programs in the nation. Northern Maine Community College offers two-year programs that prepare learners to enter the workforce or transfer to a senior college. The school offers associate programs in nursing, business administration, early childhood education, and community paramedicine. The associate in arts in liberal studies is easily transferred to a four-year college. Students take a broad curriculum in general education subjects such as writing, natural science, and the humanities. The school also offers programs that train students for trade and technical occupations. This includes the only associate degree in automotive collision repair program in northern New England. Students may also earn associate in applied science degrees in computer and networking technology, diesel hydraulic technology, building construction technology, and electrical construction and maintenance. More than 90% of NMCC students secure employment after graduation or continue their education, making this one of the best community colleges in Maine. If you're thinking about applying to one of the best colleges in Maine, continuing reading to learn more about living in the Pine Tree State. Maine, the most northeastern state in the U.S., is known for its natural beauty and offers plenty of sightseeing opportunities, from beaches to parks to forests. Maine's coastal maritime culture is evident in the 60 lighthouses built along its 4,000-mile, rocky coastline. Toward the interior of Maine lies the Appalachian Trail, which culminates at the mile-high Mt. Katahdin. Back east and to the north lies a range of famous lakes where mountains meld into the sea at Acadia National Park. Arts and culture patrons will enjoy 73,000 works of art along the 200-mile Maine Art Museum Trail. The state boasts a variety of annual county fairs and festivals, celebrating everything from Maine heritage and maritime history to outdoor music. Maine is well known for its seafood cuisine, particularly lobsters and clams, as well as its low-bush wild blueberries—all of which are a central part of its annual traditions and celebrations. Maine's largest cities, and most of its colleges and universities, are located along or close to the coast. Portland is the state's most densely populated city, holding 40% of the state's overall population. There are large swaths of forestland in the state's interior that remain uninhabited. Manufacturing, mostly wood and paper products, remain the driving industry in Maine. Construction; Agriculture, Forestry, and Fishing; Trade, Transportation, and Utilities; and Retail Trade also have a comparatively sizable place in Maine's economy. As of August 2015, the overall unemployment rate for Maine was 4.5%. Parents and/or guardians must be Maine residents in order for dependent students to attain residency status. In case of separation or divorce, students may be granted residency status if either parent is a resident of Maine and has contributed more than 50% financial support for at least one year prior to the semester for in-state status. An individual has lived in Maine (for other than educational purposes) for a minimum of one year prior to registration or application to a university. Students who are the domestic partner or spouse of a resident who has been continuously employed full-time for at least one year prior to the student's application may be considered residents. Members of the Armed Forces and their dependents and spouses/domestic partners are considered residents while stationed on active duty in Maine.